Located in 3 counties, in the Finger Lakes Region the refuge is open every day. Travel by car is limited in winter when the weather turns too wintry for safe driving. But you are always welcome to hike and enjoy the well traveled trails. You are welcome to snowshoe, cross-country ski, bring your binoculars and your camera and enjoy. Wildlife such as white tail deer, fox, and rabbits abound. Blue Jays, Nuthatches, Woodpeckers, and Chickadees can be seen and heard in winter. Tasha, one of the full time employees, says that the Refuge is an Atlantic flyway for migratory birds, and a precious resource for the birds and as well as for us. She also pointed out that the wetlands filter water which is another wonderful benefit. Some recent bird sightings were: Fish crows, Redpolls, Screech Owl, Townsend Solitaire and many others. Montezuma National Wildlife Refuge is in partnership with D.E.C. land, and the Montezuma Audubon, which is further north on Rte. 89. At the refuge there is a program called M.A.R.S.H. (Montezuma Alliance for Restoration of Species and Habitats) where volunteers do biological work alongside biologists. They do Raptor surveys, on MARSH days, they pull invasive plants, and do Black Tern surveys, and duck banding. 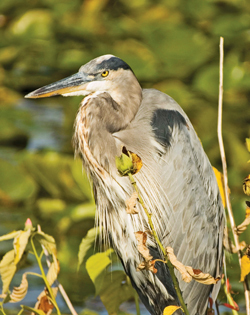 You can be a Friend of Montezuma Audubon by checking out the website or by calling 315-365-3580. Friends put on presentations and lecture series. What a wonderful resource in our Finger Lakes. We are so fortunate. The Montezuma Wildlife Refuge is here for our enjoyment.